I’ve never been a big fan of Yelp (partial to Foursquare for social aspect) but Yelp’s latest feature has me taking a second look. Today it’s iOS app was updated to include the ability to order food and pick it up or have it delivered directly from restaurants all within the app. Their blog describes this ability at select locations is provided now through partnerships with sites like delivery.com and Eat24. This is not a new idea as I can order Pizza Hut directly through my XBox and other native apps but to have the ability to use a popular location search service like Yelp and place your order at the same time I gotta say I like. I can’t stand calling orders in; it’s a weird pet peeve of mine. I usually volunteer to pick up carry-out just so long as I don’t have to call it in. I just don’t like dealing with people on the phone and I know I’m not alone in this. It’s this sort of no hassle formula that makes services like Groupon so successful. What if you could also schedule a yoga or dentist appointment once you’ve located the office? 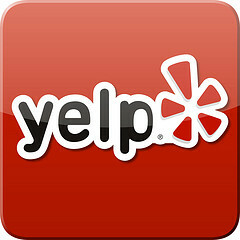 Yelp claims that ability is coming also.